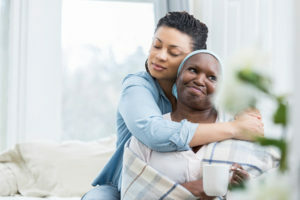 Learn what commonly used sentiments are better left unsaid when a loved one is facing a health crisis. Have you ever walked into the office or a get-together with friends or family and had a person say to you with great concern, “You really look tired today!” Even though you may have been feeling fairly perky prior to that moment, unexpectedly you actually DO feel tired and rundown. The words we speak to each other, combined with the manner by which we interpret them, are meaningful. And when speaking with individuals who have a chronic medical condition, or who are facing a health crisis, it’s crucial that you carefully think about what to express, and maybe more to the point, what NOT to say, to help the individual feel his or her best. “My cousin had the same medical diagnosis and was ill for months.” Discussing negative stories about an individual with the same diagnosis is a surefire way to bring the person’s spirits down. Instead, understand that each person experiences health problems differently, and concentrate on the positives the person you’re speaking with has achieved. “If you’d only stopped smoking (or exercised, or followed a healthier eating plan, etc.) this couldn’t have happened.” It is impossible to determine whether the result could have been different if healthier choices had been made, and there’s no benefit in playing “what if.” Concentrate instead on offering the help and empathy the person needs now, and leave any feelings of judgment at the door. “Do you remember…?” Particular to people who have dementia or other cognitive impairment, memory prompts such as this can add to the frustration and agitation already experienced. Sharing stories from days gone by, as though they’re brand-new, is an effective way to engage the person instead. Your very best bet is to permit the individual the chance to communicate (or not to share with you) about his or her experience and thoughts, hold the individual’s hand if it is welcome, provide a bright bouquet of flowers or another small present or treat, and just extend your affectionate, loving presence and encouragement. To get more care tips, or for hands-on help with experienced care in the familiarity of home, call on Home Sweet Home In-Home Care, the St. Joseph, MI senior care experts. We’ll offer knowledgeable, caring assistance that delivers comfort and peace, through companionship, help with daily meals and housework, transportation to medical appointments and procedures, running errands, and so much more. Give us a call [S5] at 269-849-9252 to find out how we can help. Eric founded Home Sweet Home In-Home Care after his grandmother had a less than stellar experience with two home care agencies. Eric knew seniors in the St. Joseph area needed a better solution to help them feel safe, secure, and comfortable at home. He partnered with long-time friend Joseph Najacht to create Home Sweet Home In-Home Care, a senior care agency that strives to care for clients as if they were family and provide services that give clients a sense of reassurance and control that they might have felt was being lost through the aging process.